In the internet era customers are given a wide range of choice to decide. E-commerce websites should sell high quality products at a cheaper price compared to their competitors and deliver the product as quick as possible and to offer professional customer support functions. A successful E-commerce website should have all the ingredients mentioned above to be successful. 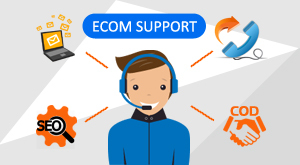 E-commerce websites needs to employ and invest on back end staff to make the sales process smooth for their customers. It demands high cost and not many companies are afford to do it. Here is the solution, we at ISPL handle all your back end support functionalities clubbed with customer support to reduce your cost and make your business profitable in the price driven business. We offer the following services to our E-commerce clients. Outbound to Confirm Order With COD Customers. Co-ordination With Courier & Ware House Companies. We can offer flexible commercial model like fixed monthly pay or pay per call options. Send Your Enquiries here and we will be happy to discuss with you to reduce your costs.